Whether peak annual Humira sales will ever reach the Lipitor benchmark is open to conjecture. Current consensus forecasts indicate that sales of the anti-TNF product will peak at $11.2 billion in 2016, before a steady decline driven in part by loss of market share to oral alternatives, such as Pfizer’s Xeljanz. That said, if Humira can maintain the growth momentum seen in Q4 2012, these estimates may be revised upwards. Illustrated in the table above, FirstWord has identified 19 products which have delivered peak annual global sales in excess of $5 billion. 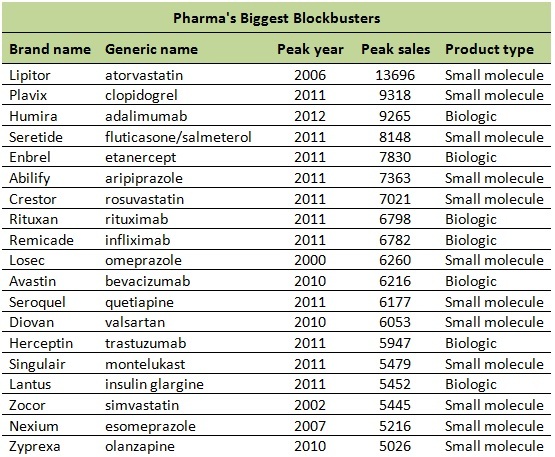 Tellingly, each of the products in the list best positioned to record an increase in peak annual sales over the next five years is a biologic; Humira, Enbrel, Rituxan, Herceptin and Lantus being the chief candidates. This is driven by a number of factors – the later launch of certain brands, for example – but also illustrates the robustness of leading biologic franchises that do not face direct substitutable generic competition. Closer analysis of cumulative sales across the five biggest selling products on a peak annual sales basis provides for some interesting trends. Four of the five products (Humira being the exception) were launched within a two year period (1997-1999) – a statistic which tells its own story. 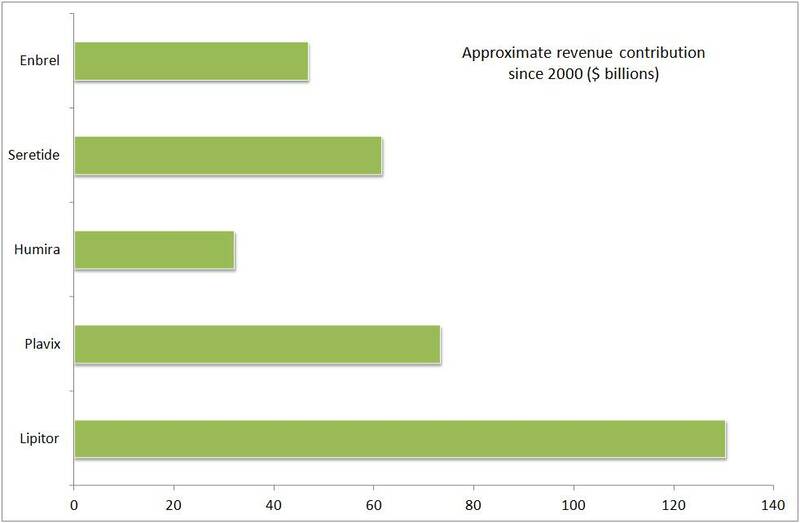 The figure below details cumulative revenues derived from each franchise since 2000, and while direct product-by-product comparisons are difficult it is useful for illustrative purposes. Reflecting in part its later launch – but also its market characteristics – Humira is forecast to contribute revenues of around $58 billion between 2013 and 2017, while Enbrel is forecast to contribute $45 billion. Thus Humira will further cement its status as one of the industry’s biggest selling products of all time over the next few years, and given uncertainty both in terms of branded and biosimilar competition, perhaps will catch the peak annual sales level set by Lipitor.